One of the most common knee injuries in sports is patellar tendonitis. Generally considered an overuse type of injury, there are many factors that can contribute to this frustrating and painful knee injury. Also known as "jumpers knee", understanding what causes this injury, common signs and symptoms, and effective treatments can help in both prevention and recovery. 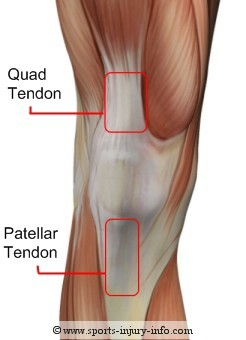 The patellar tendon is located between the patella (kneecap) and the tibia. 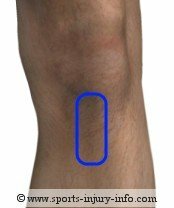 It is generally anywhere from 3-5 inches long, and connects the patella to the lower leg. Remember, the quadriceps muscles of the upper leg all insert into the patella, and then into the tibia through the patellar tendon. This injury is an inflammation of the patellar tendon. Inflammation is caused by irritation of the soft tissues, and is the first stage of healing. 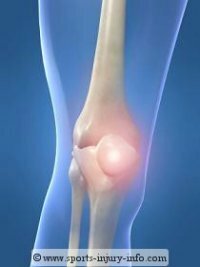 Because of the constant stresses on the patellar tendon during sports activities, the patellar tendon can become irritated, and this inflammation becomes chronic. The most common activities that cause this injury include jumping, running, and going up and down stairs. Because the patellar tendon attaches the quadriceps muscles to the lower leg, any activity that requires use of the quads can place stress on the patellar tendon. This stress is increased with high level activities like jumping. It is common in basketball and soccer, as well as other sports that involve running and jumping. In addition to specific sports activities, many other factors can potentially contribute to this injury. The most common factor is poor flexibility, especially in the hamstrings. The hamstrings act as opposites to the quadriceps, working to bend the knee during contraction. Because of this opposites relationship, tight hamstrings can increase the amount of stress on the patellar tendon by decreasing the range of motion available at the knee during activity. Tightness of the calf muscles can also contribute to increased stress on the patellar tendon. Excessive amounts of activity, without proper resting times or gradual accommodation can result in injury. Athletes that jump right into their sport, without gradually increasing their activities can suffer from patellar tendonitis. This occurs because the stress they are placing on the tissues is much more than the body is used to, and results in irritation of the tissues. This makes a gradual increase in activities at the beginning of the season or when just starting a new activity very important. Time to rest and allow the body to recover is also important. Participating in sports activities every day, without time for the body to recover can contribute to overuse injuries. In addition to flexibility, proper strengthening of the quadriceps, hamstrings, calf muscles, and the hips and core are important in prevention. Poor quad or hamstring strength, or weak hips and core musculature can also contribute to patellar tendonitis. The most common complaint with patellar tendonitis is pain. It is generally located directly below the patella, along the length of the tendon. Pain may be localized to the small bony bump on the front of the shin, the tibial tuberosity, where the patellar tendon attaches. Patellar tendonitis generally begins with pain at the beginning of activities, usually subsiding after you get warmed up. This is the first stage, and is relatively unrestricting, more so just a bit annoying. From here, it generally progresses to pain occurring after activity. Once you are finished with your workout, after your body cools down, you knee begins to ache. This may last for a few hours, or even into the next day. This is the second stage. As patellar tendonitis becomes more severe, pain is present during sports activities, and soreness remains into the next day. The most severe cases involve pain with everyday activities, especially with going up and down stairs, standing up from sitting, and long periods on your feet. Pain and acheyness is usually present, and your sporting activities are extremely painful. This is patellar tendonitis at its worst. Because of its chronic nature and numerous contributing factors, patellar tendonitis generally requires some type of treatment in order to resolve the problem. The first step is to treat the symptoms of pain and discomfort. This must be done in order to then treat the underlying causes of flexibility and strength. Ice and rest are generally needed in order to treat the pain and discomfort associated with patellar tendonitis. Ice massage or ice packs are a good way to start. 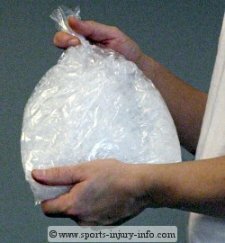 Ice should be applied following activities, and in the later stages of the injury, several times a day. Applying ice when the knee is painful, as well as after activity helps to reduce the inflammation and irritation of the tissues. Ice massage for about 10 minutes or an ice pack for 15-20 minutes works best. Rest is also beneficial. Activities that cause pain continue to add to the inflammation, and the body is unable to recover. 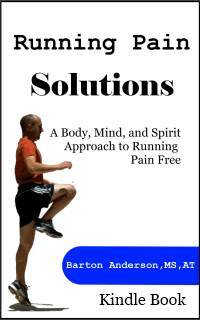 Resting from aggravating activities such as running and jumping allows time for recovery and healing. Along with treating pain, improving flexibility and strength is also important. A proper warm up before activities, along with adequate stretching of the entire lower extremity helps in preventing patellar tendonitis and improving flexibility. However, in order to make gains in flexibility, stretching should be performed several times a day, everyday. Strengthening of the quadriceps and hamstrings can be accomplished with simple exercises like straight leg raises, leg press, hamstring curls, lunges, and many others. Ask your certified athletic trainer for more ways to strengthen your lower extremity muscles. While strengthening is important, it is best to only perform exercises that do not increase your pain. Remember, anything that increases pain is contributing to the inflammation of the patellar tendon, and slowing the recovery process. As ice and rest help to reduce inflammation and pain, strengthening can slowly be worked in. Another way to treat patellar tendonitis that many people find helpful is the use of a knee strap or cho pat strap. This is a type of brace that surrounds the knee and compresses the patellar tendon. It helps to spread out the stress on the tendon, and reduce pain. Cho pat straps can be a way to reduce pain, but shouldn't take the place of other treatments. I have used Cho-pat type straps with patients I am treating on numerous occasions. It allows them to have less pain and continue playing while we work on improving their flexibility and strength. While patellar tendonitis is a very common knee injury, it can be prevented with proper warm up and routine stretching, as well as a gradual increase in activities and proper conditioning. Early treatment with ice and rest while still in the first stages can greatly decrease the overall recovery time. If you notice knee pain, see your family physician or certified athletic trainer early to prevent worsening of the condition.